Where did Jesus turn water into wine? Excavations at Khirbet Cana in lower Galilee provide compelling evidence that the town where Jesus’ first miracle was performed has been found. The discovery of a large Christian underground veneration complex suggests that the site may have been worshiped as Cana of Galilee by early Christians since the fifth century C.E. Photo: Courtesy Khirbet Qana Project. Jesus’ first miracle was performed in Cana of Galilee. When the wedding party in Cana ran out of wine, Jesus commanded the servants to fill up six stone jars with water. After he is offered a cup from one of the jars, the chief steward of the wedding discovers that he is drinking wine (John 2:1–11). Where did Jesus turn water into wine? Where is Cana of Galilee? There are at least five candidates for Cana in the Bible, but, according to archaeologist Tom McCollough in “Searching for Cana: Where Jesus Turned Water into Wine” in the November/December 2015 issue of BAR, only one site offers the most compelling evidence. Nine miles from Nazareth lies the site of Khirbet Cana (or Khirbet Qana—“the ruins of Cana”) in lower Galilee. Excavations at Khirbet Cana began in 1998 under the direction of the late Douglas Edwards. BAR author Tom McCollough joined the project as field director in 2000 and became codirector in 2008. Several factors have led McCollough to believe that the Bible’s Cana of Galilee, where Jesus’ first miracle was performed, has been found. Archaeological work has revealed that Khirbet Cana was a modest, well-connected Jewish village in the Hellenistic and Roman periods (323 B.C.E.–324 C.E.). Khirbet Cana’s Jewish identity has been confirmed by the discovery of a Roman-period synagogue, several miqva’ot (Jewish ritual baths), six Maccabean coins and an ostracon incised with Hebrew letters. In the free ebook Who Was Jesus? Exploring the History of Jesus’ Life, examine fundamental questions about Jesus of Nazareth. Where was he really born—Bethlehem or Nazareth? Did he marry? Is there evidence outside of the Bible that proves he actually walked the earth? Khirbet Cana was thus indeed a vibrant Jewish village in antiquity, but was it Cana of Galilee from the Bible? Christians in the Byzantine period seemed to think so. Perhaps the most persuasive evidence that early Christians identified Khirbet Cana with New Testament Cana is the large Christian underground veneration complex discovered by the archaeological team at the end of the first excavation season. An extensive underground exploration revealed that at least four caves comprise the cave complex. The first cave, which has been excavated, was lined with plaster dating from the Byzantine through the Crusader periods (415–1217 C.E.). Greek graffiti scrawled on the walls of the caves record the presence of Christian pilgrims: some read “Kyrie Iesou” (“Lord Jesus”), some depict crosses and some seem to record pilgrims’ names. 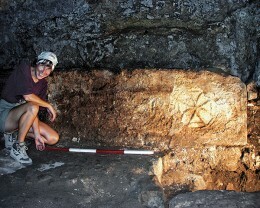 Even more fascinating, the archaeologists found in this first cave what may be an altar: A sarcophagus lid (see image above) inscribed with Maltese-style crosses had been turned on its side to serve as a kind of altar, its top edge worn smooth, perhaps by pilgrims who placed their hands on it during prayer. Above the “altar,” a shelf with two stone vessels had been found. As mentioned earlier, there are at least four other candidates for the Bible’s Cana of Galilee. Khirbet Cana, in fact, is not even the site most visited by tourists today. So why does McCollough believe Khirbet Cana is the best candidate for New Testament Cana? 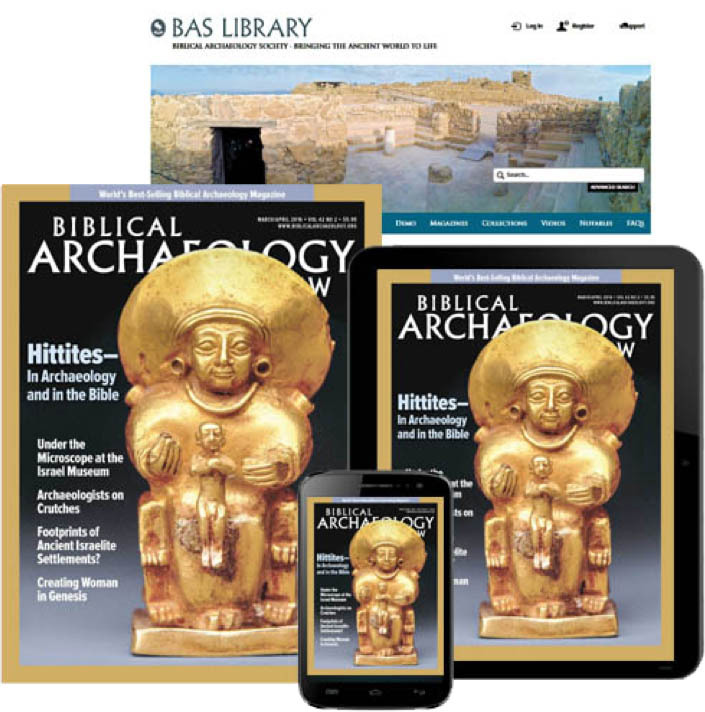 Learn more about the evidence supporting Khirbet Cana’s identification with the site of Jesus’ first miracle and the reasons why the other candidates’ identifications don’t hold water by reading the full article “Searching for Cana: Where Jesus Turned Water into Wine” by Tom McCollough in the November/December 2015 issue of BAR. Subscribers: Read the full article “Searching for Cana: Where Jesus Turned Water into Wine” by Tom McCollough in the November/December 2015 issue of Biblical Archaeology Review. Where Is the Original Siloam Pool from the Bible? This Bible History Daily feature was originally published on October 5, 2015. Domestic violence could be attributed to the Bible teachings of women and children being possessions. Did the Lord Jesus ever drank wine at the wedding in Cana or any other place? So, what wedding was this, what water, what wine? What was there about the being, life and teaching of Jesus that turned the water of a wedding into fine wine? Anything? What Marriage, what Bridegroom, what Bride? And does any of that have anything to do with what Marriage is? Was there something Jesus was, said or did that inspirited Marriage? Or was this miracle simply looking for a place to happen with this place, with its drunken wedding party, a handy prop. Was the miracle all about Jesus the miracle worker or was there something being said about Marriage and Mother? Should we be looking at Jesus or should we be looking at the Bride and Groom. “Your faith has made You well.” So where then should we be looking, at Jesus or at the faith of the faithful? Was Jesus too a prop and the Bride and the Bridegroom the miracle? Correction: the quote from my previous comment was from “Before the Muses; An Anthology of Akkadian Literature, vol 1,” by Benjamin R. Foster, p. 354, and is available in personal document form online. Note the duality of the cane-brake and reed-mat that were used in southern Mesopatamia to regulate the flow of river water compared with the shrub and herb of the field that prevents soil erosion in the dryer conditions of the Negev desert (Genesis 2:5). The footnote explains the Apsu as being the freshwater and while the term “matrix” that is applied to the mother ocean Tiamat is the word “mummu” which means “wisdom” or “skill” and can be compared to the primordial wisdom described in Proverbs 8:30 as a “master craftsman” (Hebrew “amon,” a term that dates back to the city of Ebla in the 25th century B.C.E. that refers to the leader of a scribal school). “Now the Passover of the Jews was near, and Jesus went up to Jerusalem (John 2:13). The observance of Passover from Exodus chapter 12 coincided with the time when the Babylonian New Year was observed in the spring when the barley is harvested. Personally I regard the winter barley crop as the cruder cereal of the two, with wheat being harvested in the autumn when it was the Jewish New Year. Thus, the vernal equinox serves as a time-frame for the wedding feast, and the barley harvested is signifying the earlier work of the gospel of Mark who was the companion of Peter in Egypt (think Passover) while the refined product of wheat is the gospel of Matthew (which is based upon the Mark version) which includes the chronology at the beginning of Jesus being a descendant of the Davidic dynasty (think Babylonian rite of ” taking the hand of Bel,” which is another epithat of Marduk). “The Babylonian ceremonies consisted of a sequence of rites which were concerned (1) with celebrating or marking the spring barley harvest; (2) with a patronal festival of the city-god, Marduk, including his enthronement (known as ‘taking Bel by the hand’), incorporating (3) symbolic representation of certain episodes in the Babylonian Epic of Creation; (4) with marking the calendrical aspect of the New Year; (5) with the affirmation of the king as bearer of the sacred duties of kingship; and (6) with the reception and enthronement of the God Nabu” (“Gods, Demons and Symbols of Ancient Mesopatamia” by Jeremy Black and Anthony Green, p.137). Then in John 1:24-25 we learn how alone he was in the big city in this gospel version that is “filled to the brim” (John 2:7) with wisdom. Apparently there was a pre-Christian belief in 2 messiahs; the Messiah son of David and the Messiah son of Joseph (Ephraim), and that this narrative written in the gospel of John, though a century after “Gabriel’s Revelation” was composed, is the fulfillment of this prophecy, with Jesus giving the first “sign” on the third day after being baptized by John. Now the narrative beginning with John 2:1 is a continuation of the previous chapter in John’s gospel that makes the wedding occur on the third day after Jesus was baptized by John the baptizer. We know from the evidence at Qumran where a ritual immersion bath was found, that the account provided by Josephus was correct, and that the baptism of Jesus was in accordance with the Essene sect’s ritual water purification that new adherents were given to make them at least eligable for membership in the commune (Josephus; The Wars of the Jews, 2.8.7 }. The fact that Jesus tells Nathanael that he had a vision of him under a fig tree (John 1:48) is a tantalizing clue referring to the cave that was converted into a shrine for pilgrims during the Byzantine and Crusader periods, where there is presently a fig tree on top of the cave entrance. Jesus also tells Nathanael (who was from Cana, John 21:2) and the other disciples that they will ‘see the heaven opened up and the angels of God ascending and descending to the Son of man” (John 1:51). This was also among the oaths taken by Essenes, that they will “equally preserve the books belonging to their sect, and the means of the angels” (Wars, 2.8.7 ). Commentator Bob brings up a good point about Jesus’ initial reluctance to succumb to his mother’s entreaty to intervene on behalf of the wedding guests for such a mundane matter. From McCollough’s article in the current issue of BAR (pp. 32-33) we see evidence that the site of Khirbet Cana had a Jewish identity with its own synagogue and perhaps Jesus’ mother was trying to avert a situation that occurred at the synagogue in Nazareth where the people “took offense at him” (Matthew 13:57, Mark 6:3, while the account of the townspeople trying to throw him off a cliff in Like 4:29 can be called into question as there is no indication that the town was built on a cliff). In other words, this generation is being manipulated by people who are not busy with the business at hand but are immature control freaks who have nothing better to do than to play center stage in everyone’s affairs. Jesus appears very frustrated on this occasion to lash out at his mother. Why so emotional? Was this an account of his own marriage to Mary Magdalene as reported by recent authors? Perhaps he felt entrapped in this situation and the entire concept of matrimony as many do today. Were that we were all there! Exact places DO matter, because Jesus is no phantom. But they are not for obsession. Diligent research is of interest because it glorifies the Incarnate God. He really stood & acted & taught in various locations. Moses’ first miracle was turning the Nile waters to blood; provision of wine at a wedding — a week-long party, for which guests left their work, expecting enough food & drink to make it worthwhile. There are cases where unsatisfied guest Sued the Groom for failure to provide them enough! Jesus steps in to the Bridegroom Role, revealing what He will do in “His Hour” yet to come, when He sheds His own Blood on the Cross, that His Bride may come forth from His Side, in Blood & Water. Was Jesus being disrespectful or unkind in the way he addressed his mother at the wedding feast in Cana?—John 2:4. Shortly after his baptism, Jesus and his disciples were invited to a marriage feast in Cana. His mother was also there. When the wine ran short, Mary told Jesus: “They have no wine.” In response, Jesus said to his mother: “What have I to do with you, woman? My hour has not yet come.”—John 2:1-4. Today, for someone to address his mother as “woman” and to say to her “what have I to do with you?” would likely be considered disrespectful, even insulting. But to lay such charges against Jesus would be to ignore the cultural and linguistic context of the event. An understanding of the usage of these expressions in Bible times would be helpful. Regarding the term “woman,” Vine’s Expository Dictionary of Old and New Testament Words notes: “Used in addressing a woman, it is a term not of reproof or severity, but of endearment or respect.” Other sources agree with this. For example, The Anchor Bible says: “This is not a rebuke, nor an impolite term, nor an indication of a lack of affection . . . It was Jesus’ normal, polite way of addressing women.” The New International Dictionary of New Testament Theology explains that the word “is used as an address with no irreverent secondary meaning.” And Gerhard Kittel’s Theological Dictionary of the New Testament says that such usage “is in no way disrespectful or derogatory.” Thus, we should not conclude that Jesus was being rude or unkind to his mother in addressing her by the term “woman.”—Matthew 15:28; Luke 13:12; John 4:21; 19:26; 20:13, 15. From these Bible examples, we can see that the expression “what have I to do with you?” is often used, not to show disdain or arrogance, but to refuse involvement in some proposed or suggested action or to express a difference in viewpoint or opinion. What, then, can be said about Jesus’ words to Mary? When Mary told Jesus, “They have no wine,” she was evidently not simply informing Jesus of that fact but suggesting that he do something about it. Jesus used that common idiom to turn down Mary’s subtle suggestion, and his added words, “My hour has not yet come,” help us to see the reason for his doing so. From the time of his baptism and anointing in 29 C.E., Jesus was keenly aware that it was Jehovah’s will for him, as the promised Messiah, to follow a course of integrity that would culminate in his death, resurrection, and glorification. “The Son of man came, not to be ministered to, but to minister and to give his soul a ransom in exchange for many,” he said. (Matthew 20:28) As the time for his death neared, Jesus made this clear by saying: “The hour has come.” (John 12:1, 23; 13:1) Thus, in his prayer on the night before his death, Jesus said: “Father, the hour has come; glorify your son, that your son may glorify you.” (John 17:1) And, finally, when the mob arrived to arrest him in Gethsemane, Jesus roused the apostles from sleep and said: “The hour has come! Look! The Son of man is betrayed into the hands of sinners.”—Mark 14:41. At the wedding in Cana, however, Jesus had just embarked on his ministry as the Messiah, and his “hour” had not yet come. His primary objective was to do his Father’s will in the way and at the time that his Father directed, and no one could interfere with his determined course. In conveying this to his mother, Jesus was firm but in no way disrespectful or unkind. Mary, in turn, did not feel embarrassed or insulted by her son. In fact, sensing Jesus’ meaning, Mary told those ministering at the wedding: “Whatever he tells you, do.” Rather than ignoring his mother, Jesus performed his first miracle as the Messiah—turning water into quality wine—thus demonstrating a fine balance in doing his Father’s will and acknowledging his mother’s concern.—John 2:5-11. I’m by no means a theologian or archaeologist, though my heart is very much in embedded in both; I have simply gone as far as studying Bible Hermeneutics. When we read the words that have come from Jesus himself, we must understand that He never spoke just for the sake of saying something. His words had depth and meaning beyond our reasoning. What has always dawned on me is why Mary, the mother of Jesus, mentions to Him that the wine had run out. Till this moment, Jesus had not performed any miracles – she had not witnessed any. What compelled her to announce this to Him, and why did Jesus respond with the words, “Woman, what concern is that to you and to me? My hour has not yet come.” (NRSV) One would NOT expect these words from Jesus, the Son of God – He would NOT have responded with these words, because in our modern day English, this is understood as “What do you or I care”? And Jesus CARED very much about everything! It annoys me sick, how the Bible has been translated into a ‘hundred and one’ ways to suit the interest of different bodies, but not that of Christ. And I probe another question to anyone who could possibly shed some light please; and that is WHY would Jesus’s mother go on to tell the servants to do as Jesus would instruct, ‘despite’ the preceding remark Jesus had made? Yes, Kurt. Jesus is our savior for our needs not wants. Jesus conveyed to people that their concerns mattered to him. For instance, consider the first miracle Jesus performed. He was attending a wedding feast in Cana, a town in Galilee. An embarrassing problem arose—the wine ran out! Jesus’ mother, Mary, told her son what had happened. And what did Jesus do? He had the attendants fill up six large stone jars with water. When a sample was taken to the director of the feast, why, it was fine wine! Was that a trick, some sleight of hand? No, the water “had been turned into wine.” (John 2:1-11) Turning one thing into another has long been a dream of humans. For centuries, men called alchemists tried to turn lead into gold. They never succeeded—although lead and gold are, in fact, remarkably similar elements. (footnote)What about water and wine? Chemically, water is simple, a combination of two basic elements. Wine, on the other hand, contains nearly a thousand components, many of them complex compounds! Why would Jesus perform such a marvelous deed in answer to something as trivial as a shortage of wine at a wedding feast? The problem was not trivial to the bride and groom. In the ancient Middle East, hospitality to invited guests was of profound importance. Running out of wine at the wedding feast would have caused the bride and groom considerable shame and embarrassment, casting a pall over their wedding day and their memories of it in the years that followed. The problem mattered to them, and it mattered to Jesus. So he did something about it. Can you see why people would approach him with their concerns? Students of chemistry know that lead and gold are quite close on the periodic table of elements. An atom of lead simply has three more protons in its nucleus than gold has. Modern-day physicists have even converted small amounts of lead into gold, but the process requires so much energy that it is not cost-effective.